Multimedia mining primarily involves information analysis and retrieval based on implicit knowledge. The ever increasing digital image databases on the internet has created a need for using multimedia mining on these databases for effective and efficient retrieval of images. Contents of an image can be expressed in different features such as Shape, Texture and Intensity-distribution (STI). Content Based Image Retrieval (CBIR) is the efficient retrieval of relevant images from large databases based on features extracted from the image. The emergence and proliferation of social network sites such as Facebook, Twitter and LinkedIn and other multimedia networks such as Flickr has further accelerated the need of efficient CBIR systems. Analyzing this huge amount of multimedia data to discover useful knowledge is a challenging task. Most of the existing systems either concentrate on a single representation of all features or linear combination of these features. The need of the day is New Image Mining techniques need to be explored and a self-adaptable CBIR system needs to be developed. Data mining is the process of extracting useful non-trivial knowledge from huge data repositories. These techniques have gained popularity in various application domains including medicine where a huge amount of data is available in the form of medical images. However, the subjective analysis of these images by radiologists is vulnerable to inter and intra-observer variability. These variations depend upon image quality as well as the expertise of the radiologists. Computer-aided diagnosis (CAD) systems are therefore employed as second readers to improve upon the precision in diagnosis; thereby enhancing the survival rates. 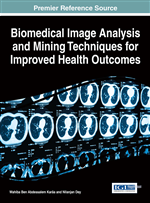 Hence, there is a considerable interest among researchers to develop medical image mining techniques to design efficient CAD systems using medical images obtained through various imaging modalities, like X-Ray, Computed Tomography (CT), Magnetic Resonance Imaging (MRI) and Ultrasound (US). Feature Extraction: The first step in the process is extracting image features to a distinguishable extent. Matching: The second step involves matching these features to yield a result that is visually similar (Shadma Parveen et al., 2013). Security Check: Finger print or retina scanning for access privileges. Medical Diagnosis: Using CBIR in a medical database of medical images to aid diagnosis by identifying similar past cases. Crime Prevention: Automatic face recognition system, used by police forces. Automated Inspections system for the manufacturing industries.